The fabulous folks at Far Fetched Fables will record “The Demi-Arcanist’s Will” for their excellent podcast. I don’t have a date yet, but this is the place to look for the news. 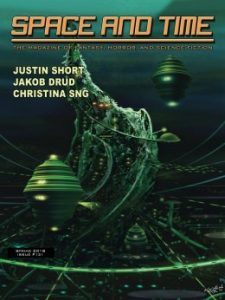 If you can’t wait to read the story, you can find it in anthology The Worlds of Science Fiction, Fantasy and Horror vol. 2, edited by Robert N Stephenson. The anthology is free to download and it contains stories by great writers like James van Pelt. Until the podcast is up you can enjoy the other stories on Far Fetched Fables. The current issue has a story by the amazing Barbara A. Barnett, and you can also find recent stories by Alex Shvartsman, Addison Smith and Ken Scholes. More coolness. Far Fetched Fables (part of the District of Wonders) have made a podcast of ‘Master of Business Apocalypse’, which originally appeared in the UFO 3 Anthology. You can listen to the story – and “1348” by Russell Hemmell – via this link. It’s the first time I’ve had a story narrated, and I think Jonathan Sharp does a great job.